068: Do I HAVE to pretend play with my child? In this final (unless something else catches my interest!) episode in our extended series on play, Dr. Ansley Gilpin of the University of Alabama helps us to do a deep dive into what children learn from pretend play, and specifically what they learn from fantasy play, which is pretend play regarding things that could not happen in real life (like making popcorn on Mars). If you missed other episodes in this series, you might want to check them out: we started out asking “what is the value of play?”, then we looked at the benefits of outdoor play and talked with Dr. Scott Sampson about his book How to Raise a Wild Child. We wrapped up with outdoor play by trying to understand whether we should allow our children to take more risks. Bergen, D. (2013). Does pretend play matter? Searching for Evidence: Comment on Lillard et al. (2013). Psychological Bulletin 139(1), 45-48. Buchsbaum, D., Bridgers, S., Weisberg, D.S., & Gopnik, A. (2012). The power of possibility: Causal learning, counterfactual reasoning, and pretend play. Philosophical Transactions of the Royal Society 367. 2202-2212. Carlson, S.M., White, R.E., & Davis-Unger, A.C. (2014). Evidence for a relation between executive function and pretense representation in preschool children. Cognitive Development 29, 1-16. Gilpin, A.T., Brown, MM., & Pierucci, J.M. (2015). Relations between fantasy orientation and emotion regulation in preschool. Early Education and Development 26(7), 920-932. Hirsh-Pasek, K., Weisberg, D.S., & Golinkoff, R.M. (2013). Embracing complexity: Rethinking the relation between play and learning: Comment on Lillard et al. (2013). Psychological Bulletin 139(1), 35-39. Hoffman, J.D., & Russ, S.W. (2016). Fostering pretend play skills and creativity in elementary school school girls: A group play intervention. Psychology of Aesthetics, Creativity, and the Arts 10(1), 114-125. Krasnor, L. R., & Pepler, D. J. (1980). The study of children’s play: Some suggested future directions. In K. H. Rubin (Ed. ), Children’s play: New directions for child development (pp. 85–95). San Francisco, CA: Jossey-Bass. Lancy, D. F. (2015). The anthropology of childhood: Cherubs, chattel, changelings. Cambridge, U.K.: Cambridge University Press. Li, J., Hestenes, L.L., & Wang, Y.C. (2016). Links between preschool children’s social skills and observed pretend play in outdoor childcare environments. Early Childhood Education Journal 44, 61-68. Lillard, A. (2011). Mother-child fantasy play. In A. D. Pelligrini (Ed. ), The Oxford handbook of the development of play (pp. 284–295). New York, NY: Oxford University Press. Lillard, A.S., Lerner, M.D., Hopkins, E.J., Dore, R.A., Smith, E.D., & Palmquist, C.M. (2013). The impact of pretend play on children’s development: A review of the evidence. Psychological Bulletin 139(1), 1-34. Lillard, A.S., Hopkins, E.J., Dore, R.A., Palmquist, C.M., Lerner, M.D., & Smith, E.D. (2013). Concepts, theories, methods and reasons: Why do the children (pretend) play? Reply to Weisberg, Hirsh-Pasek and Golinkoff (2013); Bergen (2013); and Walker and Gopnik (2013). Psychological Bulletin 139(1), 49-52. Ma, L., & Lillard, A. (2017). The evolutionary significance of pretend play: Two-year-olds’ interpretation of behavioral cues. Learning & Behavior 45, 441-448. Paley, V. (2009). The importance of fantasy, fairness, and friends in children’s play: An interview with Vivian Gussin Paley. American Journal of Play 2(2), 121-138. Pierucci, J.M., O’Brien, C.T., McInnis, M.A., Gilpin, A.T., & Barber, A.B. (2014). Fantasy orientation constructs and related executive function development in preschool: Developmental benefits to executive functions by being a fantasy-oriented child. International Journal of Behavioral Development 38(1), 62-69. Singer, D.G., & Singer, J.L. (2013). Reflections on pretend play, imagination, and child development. Interview in American Journal of Play 6(1), 1-13. Sutton-Smith, B., & Kelly-Byrne, D. (1984). The idealization of play. In P. K. Smith (Ed. ), Play in animals and humans (pp. 305–321). Oxford, England: Blackwell. Taggart, J., Heise, M.J., & Lillard, A.S. (2018). The real thing: Preschoolers prefer actual activities to pretend ones. Developmental Science 21, e12582. Jen: 00:38 Hello and welcome to today’s episode of your parenting Mojo. We’ve done a number of episodes by now in our series on the importance of play and I think this actually might be the last of them for a while. We started out by asking what is the value of play, and then we looked at the benefits of outdoor play and we talked with Dr Scott Sampson about his book, How to Raise a Wild Child. Then we wrapped up with outdoor play by trying to understand whether we should allow our children to take more risks. 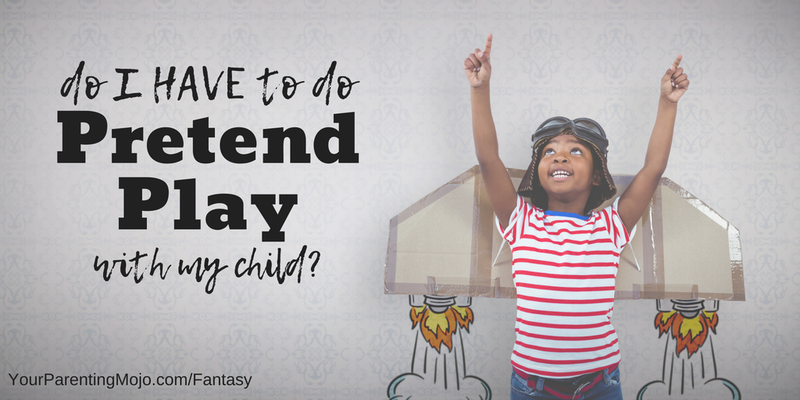 As we finish this whole series on play, I wanted to look at a question that comes up a lot in parenting groups that I’m in, which is: “my child loves fantasy play, but I just can’t stand it. What do I do?” So in this episode we’re going to try and get to the bottom of whether fantasy play really is important to a child’s development and what you can do if you just can’t stand it either. Jen: 01:24 So to help us think through these things. I’m here today with Dr Ansley Gilpin, who is an associate professor at the University of Alabama and a developmental psychologist whose research focuses on cognitive development in early childhood, so between about ages three and eight, specifically with a focus on executive functions and imagination as well as development of academic and socioemotional skills. Dr Gilpin is exploring the potential mediation effect of executive functions on school readiness intervention outcomes as well as long term intervention effects on cognitive development. Welcome Dr. Gilpin. New Speaker: 01:57 Thank you for having me. Jen: 01:59 All right, so let’s start all the way at the beginning here. I wonder if you could define for us what is fantasy play. Dr. Gilpin: 02:06 So when we talk about fantasy play in research and when I observed children doing it in their natural day to day lives I’m talking about is a type of pretend play that children tend to do on their own, which involves them pretending something that they don’t experience in everyday life. So differentiated from pretending to be a mommy or pretending to cook or pretending to go to the movies. So with fantasy play they are pretending something that they have not experienced before, like making popcorn on the moon. Jen: 02:45 Oh Wow. Okay. So that, that’s a very important distinction there. So pretend play is one thing and fantasy play is another thing as far as the research is concerned, then? Dr. Gilpin: 02:56 Pretty much. Fantasy play as a type of pretend. Jen: 02:59 Okay. Okay Great. So there has been a fair bit of research done on the benefits of fantasy play on children’s development. And when I read in the popular press about fantasy play, I see these general assumptions that are made that fantasy play is really critical for children’s development. And I know that there was a meta-analysis done, which is a study that looks at a lot of different studies and tries to understand what’s the overall direction of the evidence and you weren’t involved in that study, but I know that you’ve commented on it and your work as well, but that method analysis examined theoretical ways that fantasy play could influence a child’s development and those kind of varied from fantasy play having a critical role to being an index rather than a promoter of development to a fantasy play. Kind of coinciding with other aspects of development but not really being that important. And I was really surprised to find in that paper that the research really doesn’t support the position that fantasy play is critical to the majority of aspects of children’s development, but the far larger problem, but most of the research has such a huge methodological problems that it’s hard to say much more than fantasy play might be linked with some aspects of children’s development. I wonder if you could kind of comment on the general status of the literature and your view of it. Dr. Gilpin: 04:14 Yes. So this is one exciting part of this research, so with Dr Lillard she and her colleagues demonstrated was going through all of the research on pretense, pretend, play, imaginative play, fantasy, play, all those different types of play that are really very similar and looking to see whether or not there was research to show that really it was causal in facilitating development and part of the excitement is that we don’t know the answer to that yet and we don’t have a lot of support to show that it’s actually causing development to occur or that it is absolutely critical for development and it may not be; it may just be to her point related to development or it may enhance development. It may just develop at the same time as other skills. So we really don’t know. And as we improve on methodology and improve on our physiological measurements and biological measurements and our ability to observe naturalistic play and get multiple measures, that’s really going to help us be able to make those decisions. And so really as the research skill technique and equipment evolves, we will evolve with this question. Jen: 05:42 Okay. Yeah. And I did wonder to what extent, the way that we attempt to study pretend play is part of the reason that we’re not finding these significant effects. Because when you actually go into some of the studies that are included in that meta-analysis and you look at the methodology, you see the researchers are often going to put children in a lab and they asked them to do some kind of specific task and then they say, okay, now let’s pretend with this specific toy that I’m giving you and you have to do it in this way. And so firstly, I wonder, is it possible that researchers don’t differentiate between pretend and fantasy play in the way that you just did? And secondly, children engaging in fantasy play at home: it’s the child that says, “Mom, I’m going to make popcorn on the moon.” It’s not me that saying that. So how much of this is an artifact of the researcher telling the child how to play? Dr. Gilpin: 06:29 Right? And so I recently got a grant from the Templeton Foundation to work on that. And so what we did is we really help define the different types of play and that’s going to be important going forward just as you said, so that we’re not combining types of play when we study and confusing them and also then how we’re measuring them. So we created a measurement that parents can report on. So as a parent myself and having interviewed literally thousands of children, they say whatever pops into their head half the time and they’re not good at giving you the last six months, what was it? What did they like to do? They tell you their favorite thing was what they did five minutes ago. That’s just part of their memory development. And so it’s really going to be very interesting as the methodology changes and improves. And that is somewhat technology and somewhat learning. Developmental Science psychology is really early science and so we’re really learning as we go and it’s really exciting. Jen: 07:32 Yeah. Yeah. And I think that’s very strange for non-scientists like me to understand that this is relatively new landscape. If things that there aren’t better answers to a lot of these questions yet when we’ve been studying them for 20 or 30 years and in fact that’s not long enough to really fully understand them yet. Yeah. So one of the things that I thought was really cool coming out of that paper that you mentioned by Dr Lillard was published in 2013 and then you and your colleagues really took that and said, okay, well yes, we acknowledge the methodology and some of these papers isn’t great, so let’s see how we can do better. And so you’ve published a paper showing there’s a correlation between fantasy orientation and executive function and I wonder if you can tell some more about that please. Dr. Gilpin: 09:16 Your ability to plan and organize, which is a little bit later than the toddler years, but those are all skills that are related to how much a child participated in fantasy play. And we measured this in two ways. Both in how much they participated according to their teachers and their parents as well as how much they could show us that they could do it. So how imaginative was it really as well as their, what we call propensity towards play. So parents may have noticed, some children just really like to engage in imaginative or fantasy play and some children really don’t seem to do that very much and that seems to be an individual difference that we can measure in personality later in adulthood. And you can think about it in terms of yourself as well; whether or not you liked to go to see movies that are more imaginative, more fantastical, whether you can keep open the possibility that there might be extra-terrestrials possibly trying to be a super weirdo. Some examples here versus people who would much rather see a movie about a scientist or about mathematics. Dr. Gilpin: 11:33 right now. We did a follow up study promoted in part by Dr Lillards meta-analysis. What we did is we put the kids into three separate play conditions over a period of five weeks and in their own schools in their own way, we didn’t force them to play with a certain topic in mind; we just simply encouraged one group of kids to play in a more fantastical way by saying things like what would happen if we went and popcorn on the moon? And then gave them that cue and then let them do it. And we followed them and if all of a sudden they were cooking cookies on the moon, that’s okay too, you know. And then the other kids, we gave them a reality-based prompt. Like that was very similar in scope. Right? Let’s go make popcorn. Right. And then other children, we played games that didn’t involve imagination at all. Dr. Gilpin: 12:28 So things like hopscotch. Right. And is that an duck? Duck goose and hot potato. Right. And with other kids they didn’t get any additional play than they already got in their regular preschools. And I should mention that these were both low income preschools where there wasn’t a lot of imaginative play as well as preschools where there were quite a lot of enriched play. And what we found is the kids in the fantasy play condition showed us a change in their executive functions over the course of five weeks. So that at least tells us there is a link, that it’s not just over time this is happening, but there seems to be some sort of link. And we also found that the children who naturally had more propensity to play with fantasy play showed us an even greater increase than their peers, but even the peers that didn’t want to do it but still did it; they wouldn’t have done it on their own; we weren’t forcing them to do it, but they wouldn’t have done it on their own, but they were like, “all right, I’ll play along; whatever” they also showed us that increased but not as strongly as the peers who wanted to do it and we’re more engaged. Dr. Gilpin: 13:58 at least temporarily. So we don’t know if this would last hypothesis is that if you did it every day as part of a normal preschool curriculum, which most curriculums do to some degree than you would see that long-term increase. But again, that’s my speculation. Jen: 14:15 Yeah. And do you have plans to follow up on those children and find out? Dr. Gilpin: 14:19 Yes, it is a longitudinal followup. Jen: 14:22 Awesome. Okay. We’ll stay tuned for that then. So on. Still the topic of the research methodology and Dr Kathy Hirsh-Pasek, whom we have talked about a fair bit on the show. We’ve actually interviewed and Roberta Golinkoff, one of her colleagues and she and her colleagues think that the usual best practice way of studying an idea which is to do an experiment where we randomly assign children to different conditions and then we control for all the possible variables that we can that might be impacting the dependent variable as possible. Isn’t really so useful here because by doing all that isolation, we might end up removing some of the factors that we’re trying to understand and they argue that we should reframe the question. Instead of asking, does pretend play cause child outcomes? We should ask how much of the variance in child outcomes is attributable to play above and beyond other factors? What do you think about that? Dr. Gilpin: 15:12 Yeah, I think she’s absolutely right. So that’s the next step from what I described, right, is – and we were very conscientious and doing exactly what she recommends here in that we didn’t force them to do it a specific way and control for a million different variables, but tried to leave it as naturalistic as we possibly could because we wanted to see would we see a difference in play, like they would normally do it, right? For the most part, would we see a difference? So yeah. Jen: 15:48 So you’re sort of trying to take the best of the scientific experimental method and bring in more of an ethnographic approach and marry the best of those to come up with something that actually leads us to something that’s useful and applicable to the real world. Dr. Gilpin: 16:01 Right. And that is definitely a tight needle to thread, but she’s absolutely right. You can’t go in and control so much that you then have a completely an inpplicable situation. And also it doesn’t tell us much. What we do know is that the changes that we’re seeing are really pretty small. Right? And these are going to be really small effects, so maybe a third of a standard deviation if that means you know, so means very much so it may be five IQ points as an example. And so just a teeny tiny. I’m not suggesting that it impacts IQ, but just as an example of a third of a standard deviation, so teeny tiny incremental changes might be possible. And so that’s another good point that Dr Hirsh-Pasek says, is that really we want to know not only might it caused child outcomes but how much. Right. Jen: 16:59 Yeah. And it really, how relevant is it compared to other factors that influence the child more, you know, if we’re engaging in some kind of intervention to increase the amount of fantasy play they do in the classroom. Is this being massively outweighed by some other factor standardized testing, for example. Dr. Gilpin: 17:16 Like totally random example. Not that that’s relevant to classrooms at all. Jen: 17:22 Yeah. So what, what do you think about that? Dr. Gilpin: 17:24 Yeah, I agree with you. I think it’s really important that we consider what the actual impact is with the effect sizes of whether this is making a really small impact but positive and we weigh that specifically with the expense and the training required of the teachers and the toll that it takes on teachers and parents. So I think you mentioned in your opening that there some parents that just hate it, don’t want to do fantasy play and I would say your child can pick up on that. They can tell what they would much rather you do is engage with them and whatever you find interesting and they find interesting, right, to get there and we know that engaging one on one between a child and a parent is super enriching for children. And so my answer to that would be we’ll do what you both enjoy, right? Jen: 18:21 Yeah. Okay. So I want to get into something in terms of how the research is conducted. Because when you’re reading through our research paper, it’s not often that you actually get the script that they use. So they just say, we told the children x and then we asked them to do y and then this happened and so there was one study that I found that did include the script and so it read in part where the researcher told the children, “we’re going to make up different stories using the toys on the table. We will make up a story and play it out with the toys. Good stories have a beginning, a middle and end and use lots of imagination and pretend,” and clearly you can see where the researcher is pushing them in this direction. And I couldn’t help but think back to the episodes that we’ve done on the show on storytelling recently where we learned that children from backgrounds that aren’t white and middle class and they tell stories in a very different way from middle class white children and their stories might not have a beginning, a middle and an end or the children might actually have been verbally or physically reprimanded for telling a story that wasn’t true. Jen: 19:25 So in this single instance that we can pick up on because the script was provided. We see this issue, I wonder how we can argue that the results of these studies are relevant to all children when really we have no idea how many of them are being set up in a way that doesn’t even consider the possibility there’s any other way to see the world than the white middle-class way. Dr. Gilpin: 19:45 Right? I 100% agree with that statement that it’s really hard to design any study that would be relevant to all children everywhere, right? Much less all children in a city. Right? And so we absolutely have to consider children’s backgrounds and their culture and their previous experiences when we design these studies. So one thing that we thought about when we were talking about, well how do we come up…we were coming up with examples with those prompts, right? So let’s go make popcorn on the moon. That, well, probably most children in this city that we live in know how to make sure they understand making popcorn. So that’s good. Right? Jen: 20:30 Let me tell you, my daughter doesn’t know that, so she doesn’t know how to make popcorn. Dr. Gilpin: 20:35 We were hopeful that that most of them, most of them would. Okay, and one of the examples that we came up with was something like that. We thought most of the children and one of the schools would have experienced. One of the ideas that came up was what about we say, well, let’s fly on a plane, and then we realized, no, this is not..this is not a universal experience for all of the children, especially the children in our lower income schools. So it was really important that we picked prompts that we felt like most children had experienced or had not experienced for the fantasy. Jen: 21:16 Okay. Condition. So you are actively thinking about this in your research, but clearly not everybody is. Jen: 22:12 Wow! You’re in a tricky spot as a researcher. Dr. Gilpin: 22:13 But fascinating. Jen: 22:16 So how do you get around that? Did you have to ask about the religious orientation of your families before you start? Dr. Gilpin: 22:23 We did. Dr. Gilpin: 22:24 We did in because that tends to be related. I’ll go into that later if you want me to, but that tends to be related, but in general, we really made sure that we weren’t asking them to pretend about anything that would be against their cultural or religious beliefs, so there weren’t pretending about witches, for example. That would have definitely not been appreciated from some of the families. Or pretending about vampires. Jen: 22:52 Right. Okay. But you. You did have these children in your sample, so you are asking children who have basically no experience with pretending in their daily lives and asking them to engage in this play. I wonder how that impacted your results. Dr. Gilpin: 23:05 So it’s interesting and that they’re not allowed to pretend and there’s quite a lot of research, especially with ethnographic research and as well as anthropological research and particular Marjorie Taylor has done some great work looking at children from Mennonite backgrounds and other fundamentalists backgrounds to show that they still do it anyway. So it is a universal experience. It’s just taboo in some situations. Jen: 23:34 Okay. Alright. So you, you provided a beautiful segue into my next question, which is that in the show in general, we like to look to the anthropological literature to see how people, other cultures deal with a particular issue that we’re facing. And so we’re pretty lucky on this issue because Dr David Lancey, who has a fabulous book that we reference all the time, The Anthropology of Childhood and he covers it quite extensively and he gives a ton of examples of children in different cultures playing. But I want to quote from the conclusion because it kind of covers it most concisely and he says, “make-believe play is valued as a learning medium in nearly all cultures, in hours, parents become actively engaged with children’s make believe in purchasing or making appropriate prompts in guiding the child’s development and make believe and fantasy in linking. Make believe to reading books and stories and then using the medium pedantically to teach moral and other lessons. Jen: 24:25 When we don’t intervene to guide play, our children have a tendency to become bored. Village parents get involved and make belief only to the extent of donating materials, including miniature or cast-off tools. Otherwise they keep their distance. Boredom seems unknown.” So a lot of parents, as we’ve alluded to a couple times, don’t want to engage in fantasy play with their children because the parents just find it boring. And it seems to me that the only reason western parents need to engage in fantasy play is because the children don’t get told, go and play with the other children anymore. So if I have an only child and she gets a reasonable amount of unstructured playtime with other children, but she still wants to engage in fantasy, play with me. Can I say no? And should I say no? Dr. Gilpin: 25:10 Uh, it’s a great question. Right? So it really, I hate to do this, but it really depends on the time. Jen: 25:17 Of course. Yes, of course. Dr. Gilpin: 25:19 There some kids that would be very…would feel like they were being cast off. Dr. Gilpin: 25:25 So in that case I would say don’t break your child’s heart, do it for five minutes. And the other hand there are some children that just need to be redirected. And I do this all the time with my children and go play with your sister, go play with your friend. I think so and so is available next door. I have to do the laundry. I do. Right. But yes. So there’s great research to show that in some slightly off topic, but related in some villages and cultures, really, parents don’t talk to their kids. Jen: 26:02 They really don’t. Dr. Gilpin: 26:02 They don’t. And in fact, the children and older children in particular, the ones that are providing the language enrichment and language training and playing and teaching and, and we really as human beings, there’s plenty of research from all different areas to show that we really need human interaction. But it doesn’t have to be from your parent. Jen: 26:27 Yup. Yeah. It’s so fascinating. The distinction with our culture where the mother’s age, I guess partly, but also vocabulary and a level of education is seen as of primary importance and we’re not assuming that the child gets any amount of meaningful language development from siblings or friends, or anything like that. So yeah, so there’s not one path to raising an a well adjusted child. There are many different paths and approaches that you can take. So yeah. So the takeaway seems to be if fantasy play is something that is extremely important to your child. Then engaging in a small amount of it might be a good thing to do, but it’s not necessarily something that you feel as though you have to engage in all the time. Jen: 27:15 Let’s make the laundry fly to the moon! Dr. Gilpin: 27:17 That’s right. That’s right. Yeah, absolutely. So they want to know that you care, that you love them and that you enjoy them. But you can do that in many different ways. Jen: 27:28 Yeah. Okay. So you bring up the laundry, which is sort of like work and in a lot of different cultures. I guess I would consider it work, but a lot of cultures, very young children perform very real work from a young age, like moving water from a cistern into the house or providing actual childcare for younger siblings while parents go out and work. And in our Western, Educated, Industrialized Rich, Democratic, or WEIRD societies, we say that it’s just not appropriate for young children to work and we actually make it hard for them to do that. And then of course later we complain when they don’t want to do their chores. And so I was really interested to see one paper that says, researchers have asked why at the very ages when children are developing basic representations of the world, they engage in an activity that misrepresents reality after all, the primary task of early childhood is figuring out how the real world works. Jen: 28:22 And so that was interesting in contrast with an interview of Vivian Paley, who was a preschool teacher and she is an outspoken advocate of play; she’s written a lot of books and papers about it and she was asking in an interview, is there any downside to describing children’s play as work and Paley responded “There is no downside to a serious consideration of play as the central motivating and learning tool of young children,” but I’m wondering is it possible that children could achieve similar cognitive development through participation in self chosen work? So it’s not me standing over them saying you will do this or else, but self chosen work as they do through pretend play or is pretend play really uniquely useful at bringing out the kinds of creativity and collaboration and willingness to take risks that we know are going to be important skills for children in the future. Dr. Gilpin: 29:11 Yeah, that’s a great question. I think that Maria Montessori really addressed this with her work and her curriculum and that she really felt it was very important that when children were interacting in the classroom and learning are playing, that they used real tools so they had real cups and pitchers, made of glass. There are a lot of parents, including myself that would probably not hand there too, knowing that they for certainly would end up at the hospital in a few minutes, but she really felt that it was really important that they learn to interact with their world in a real way. And I think that children really just like to engage and experience the world and there are a lot of different ways to do this. And again, I think it goes back to these personality individual difference. That there are some children who are very creative and very imaginative and collaborative with other children and they want to do that in their play or in their work if you want to call it that. And there are other children who really want to do something that’s reality-based and that just seems to be an individual difference. Jen: 30:32 Okay. And so again, sensitively responding to your child is potentially the best way to move forward in that regard? Dr. Gilpin: 30:39 I think so. I like to ideally kind of try both. So at the moment, my two year old likes to crack eggs. Jen: 30:50 Yeah, mine went through that. Dr. Gilpin: 30:50 They love it. Yeah, it is really messy, but she really likes to do that so I’m trying to embrace the Salmonella all over the kitchen countertops as she cracks, you know, a dozen eggs but she’s really enjoying that at the moment. But previously she really enjoyed pretending like she was a princess and so we did that. And so you’ll see stability of that over time where a child…some children do both pretty well and some children really like one or the other. A very, not super rare, but pretty rare subset of kids have imaginary friends. That tends to be about a third of kids roughly kind of depending on how you define it, so if you restrict it to truly in their imagination only then it’s less, but if you allow it to be like an animated toy that they have, like Christopher Robin’s Winnie the Pooh, then it’s a little bit more, but they have imaginary friends and, and a very rare subset, about five to 10 percent actually have paracosms where they have their own imaginary world and it has currency and laws and the whole nine yards. Dr. Gilpin: 32:10 And that’s how we end up with Harry Potter and please fantastic stories. Right. Jen: 32:17 Okay. And so when parents see that their child has an imaginary friend, maybe the tendency is to think, why are they doing this? Should I be encouraging this? W, what would you say to someone whose child has an imaginary friend? Jen: 33:00 I have heard them say that. And I always think, well, what do you mean? You wrote it! Jen: 33:10 So this is the reason why I haven’t written a novel! Dr. Gilpin: 33:14 Right, right, right. So we have a lot of children that have, you know, about a third of kids have an imaginary friend and they’ll hang out for awhile with the imaginary friend. Dr. Gilpin: 33:23 Parents sometimes don’t know. So we think about maybe about half parents are aware of children have imaginary friends. Dr. Gilpin: 33:34 But no, but no. Yeah. So sometimes they do and sometimes they don’t. And what we found is that they really are very similar to real friends and terms of their impact. So if the child has a pretend friend that’s innocuous, benign or even positive, and they describe positive associations with this pretend friend, right, then I wouldn’t worry about it and you know, I may ask them a few questions about it just like you would do with any other friend. And if the child is describing very negative experiences, which is pretty rare, I should say; it’s pretty rare. But in the event that it does happen, I would try to steer clear of that imaginary friend as much as possible. Dr. Gilpin: 34:24 I would say things like, wow, he really seems to not be a nice friend just like you would with any other friend. So it’s very interesting. We had, I think Marjorie Taylor interviewed a child whose best friend was Jack the Ripper. Dr. Gilpin: 34:39 Terrifying. I think that’s, that’s the most extreme example. And we interviewed a child whose best friend kept telling her that her parents were going to get a divorce, which was apparently not the case at all, and was very, extremely upsetting. I can image for the most part they seem to be either a positive influence or benign. Jen: 35:02 Okay. So not something to worry about then? Dr. Gilpin: 35:05 Not something to worry about. Yeah, and it goes away eventually, unless you become a novelist? Dr. Gilpin: 35:10 Right. It either goes underground or goes away and typically we’ll go right around school age. When the child starts having a larger network of peers and they realized this is A, a little bit strange. I shouldn’t tell my friends about it and they don’t really necessarily need that companion. We also found that more firstborn children and more only children tend to have imaginary friends, for obvious reasons. Dr. Gilpin: 36:01 I think that would have to get rid of that one. Dr. Gilpin: 36:04 Yeah, possibly. But maybe there are monsters…I mean the child who’s terrified her parents are going to go through a divorce. I don’t know, maybe there is something going on in the house that she’s picking up on it, that she’s, that’s coming through in her fantasy play. So I’m wondering if parents notice this kind of theme in their child’s fantasy play, should they encourage the child to keep working through the issues or should they discourage it or just observe and then try and address it later by saying, you know, we’re not getting a divorce in or something. Perhaps a little less heavy handed than that. But what do you think? Dr. Gilpin: 36:35 Right? Well, this is entirely my opinion. But I think that when your child exposes you to their pretend play or their imagination, they’re doing it because they want you to be interested. And so I try to show a little interest and ask them questions about it and just follow their lead for the most part. But like you said, if it’s at all distressing to the child. And I would try to help reframe that in a way that helps the child be less distressed. Jen: 37:07 Okay. And when you say reframe it, what do you mean? Jen: 38:21 Or finding it useful in some way? Dr. Gilpin: 38:22 Or finding it useful, right. Versus they truly are very upset about the situation. And one way you can kind of tell a little bit is whether or not the distress is still there after imagination has ended, play has ended so if the child is stressed and the play has ended, then they’re probably distressed for real, if that makes sense. Jen: 38:47 Yeah. That’s very helpful. Awesome. Yeah, so I want to talk a little bit about props because I found a quote in a book on dramatic play that I loved and it says “it is a stimulant, perhaps even a condition of the active character of trueplay that is generated out of what adults usually call ‘nothing.’ If you want to see what children can do, you must stop giving them things. Says Norman Douglas in a fascinating book called London Street Games because of course they only invent games when they have none ready-made for them, like richer folks have.” This book was written quite a while ago I think, so I know that parents want to give their child advantages and so they think about providing things to encourage dramatic play. Perhaps they’ve listened to this episode and they think, okay, I’m onboard with fantasy play and I want to support it and so I’m going to go and buy props and costumes and everything I can to support my child in doing this. But I’m wondering could this actually stifled children’s creativity rather than encouraging it and in fact we should turn them outside and let them go find a stick and have that be the thing that turns into whatever it is that they want to play with that day. Jen: 41:04 In a day? Dr. Gilpin: 41:05 In a day. Jen: 41:07 And how old are these children? Dr. Gilpin: 41:07 Toddlers. So that would really interrupt their ability to pretend play, right? I mean there’s some good research to show even background TV interrupts their language because it also distracts parents from and maybe siblings from talking and language. And so I’m getting a little bit off topic so I apologize. But I don’t think that it really matters how much props they have. I think they’ll use whatever they find, but I think that they are also happy to have a princess costume if that’s what, that makes them happy and that helps them get into the play then that’s great. Jen: 41:49 Okay. So if you already have a closet full of costumes, it’s not the end of the world. Don’t go and throw them away. But also by the same token, don’t feel as though you have to go and provide those for your child to successfully engage in pretend play. Dr. Gilpin: 42:00 No. And in fact, one of the ways that we measure pretend play is by seeing how much of it they can do in their own imagination versus using a prop. So props are particularly helpful for very young children. So for example, having a baby doll at 18 months versus pretending to hold a baby doll is different in terms of their cognitive ability and is more sophisticated pretend play when they are pretending to hold the baby. Right. But there’s nothing wrong with helping them get started with a real baby. Jen: 43:22 They most often mentioned functionality for example, because you could eat real cookies or because they find the real activity more fun and I was amused to know the washing dishes was the actually the only activity where have more children so they would prefer it to pretend then do the real activity, which kind of surprised me because I know that most children love to do anything that relates to water, but it was also, yeah, it was. It’s the only activity on the list that could be perceived as a chore and is usually perceived as a chore by adults and I wonder if there’s been some kind of negative association there. But when the pretend activities were preferred, the most common reasons were to avoid the negative outcomes associated with the real ones. Like cutting yourself with a knife or because the children felt that they couldn’t do an activity. Jen: 44:04 And so to me, this represents an absolutely enormous opportunity, especially for parents who can’t stand pretend play because having now done the research for this episode, I’m going to try and better support my daughter’s fantasy play about things that couldn’t really happen by asking her questions about her fantasy environments, but if she wants me to pretend that playing at dinner, I’m going to say, would you like to go and help make real dinner? So is this something that parents can really use particularly the fantasy play-hating parents as a way of engaging their child in something that actually they might prefer to do anyway. Dr. Gilpin: 44:40 Yeah. I think that really following your child’s preference is really important because it’s going to facilitate engagement, right? And if you and the child or having a positive, enriching and rewarding experience together, then the language is going to come and the emotions are going to be there. And that’s what we know really makes a difference, right? That children need to feel loved and appreciated and cared for. And we know that that has extremely good positive experiences and positive development for kids. And so I think it’s following your lead and the child’s leads. So if there’s something you just really hate to do, like I’m sorry, I just really don’t enjoy puzzles. I know they’re very enriching for me. I don’t like them. So I do them with my child really wants to. But you know, I’m not going to pick up that one and suggest it. Jen: 45:34 Right. Yeah. Yeah. So much of parenting is dance, isn’t it? And so I guess then I would look for my daughter to do as a follow up would be if she says, no, I want to pretend to make dinner, then then we can make pretend dinner for five or 10 minutes and do that. And then I’ll say, okay, I have to go make real dinner now. Do you want to come and help? And if she says yes, I want to make real dinner, then we just go and do that. So I think that that can potentially help parents to do this dance in a way that benefits both the child and themselves and doesn’t make them feel as though they have to engage in pretend play if it drives them nuts, but I always find that if I understand why it’s important for my daughter’s development to do something, I find it easier to do it even if I really don’t enjoy it. So perhaps now coming out of this episode, it may not be so bad for you to engage in five or 10 minutes of pretend play because you know that it has potentially a beneficial outcome. But again, going back to what I think your overall message on the show has been do what creates this warm engaging atmosphere in between the two of you because that’s really ultimately what benefits your child. Dr. Gilpin: 46:40 That’s right. Definitely. And we’ll keep exploring. Pretend play in terms of its ability to possibly facilitate development. Jury’s still out as Dr. Lillard has suggested in his. Absolutely right, but we’ll, we’ll keep plugging along to see what we find out. And one of the big reasons is because it’s really highly cost effective. So the return on investment doesn’t cost much to suggest that a teacher say, let’s make popcorn on the moon, or you know, let’s go to cookie land and run around the room. It doesn’t require a lot of training, it doesn’t require a lot of props, so in that way, even if it has a small outcome, and again, jury’s still out, but if it has a small outcome and it has a small cost and a small training than it might be worth it. Jen: 47:26 Yeah. Awesome. Well thanks so much. Helping us to better understand this. I know that it has really made me more comfortable with engaging in just a little bit of pretend play because I better understand that, that it is potentially a factor that can contribute to my daughter’s development even if it’s not going to be the be all and end all factor. So I am grateful for your time and helping us to think through all this. Dr. Gilpin: 47:49 Sure. And if I can add one more thing, I really encourage parents to follow the kids lead. Let the kid decide what you’re going to pretend. You may have to give them a little prompt, but then let them do it because you’re really trying to grow their cognition, not yours necessarily. Jen: 48:05 Yeah, so it’s not the parents saying, let’s do this scenario now. You be the doctor or the nurse. Dr. Gilpin: 48:13 Right? Yeah. Letting the kid…if the kid decides there that you’re not on the moon anymore and now you’re somewhere else, then that’s okay.